Today is my lovely husband's birthday - however I am here in hospital with Daisy and he is at home watching the footy. We have friends staying over on Saturday night to look after the children so hopefully we can actually get some time together this weekend, even if it is in Daisy's hospital room. Yesterday was another busy day. The hospice had arranged for a group of mums to have a trip on the London Eye followed by lunch at the Harvey Nicks restaurant in the Oxo Tower. I had the night from hell with Daisy the night before, so was feeling very tired in the morning and not in the mood to put my glad rags on. I was also trying to catch up with Daisy's doctors to discuss plans and next steps before running for the tube to get to Waterloo in time. I did at one point find myself in the surreal situation of standing in the ward equipment room surrounded by IV poles and cardiac monitors trying to tame my wild hair into something slightly more presentable while the ward housekeeper stood guard outside! It's always good to catch up with other mums of special children, it's the best way to swap tips and get advice. It was so strange being out in the real world however and I was torn with wanting to be back with Daisy, who was quite happy in the care of one of the chase nurses. I stayed in the centre of London after our Oxo Tower lunch as Andy and I had been invited to Fortnum and Masons to tell Daisy's story to a group of invited guests at an event for the Association of Children's Hospices. I had written out Daisy's story and Andy had put together a slideshow of pics of Daisy and the children, I nearly lost it at one point however when I talked about the fact that Daisy is life limited and looked up to see grown men in front of me in tears. The event went very well and the Association of Children's Hospices hoped to have a few more corporate sponsors as a result. We travelled home on the Northern Line and Andy dropped me off at the hospital while he went home to sort out the rest of the children. Once again Daisy had a very unsettled night despite regular pain relief. We are going to try some antispasmodic drugs tonight and see if they help. I think the bottom line is we are not convinced that her gut is healing as quickly as hoped. Our consultant here is going to write the the Consultants at GOS asking again for them to do a full thickness biopsy of her gut. 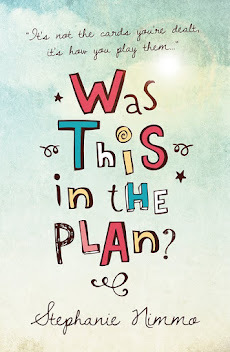 This is the only way we will know if there is hope of it getting completely better or whether it's best to just persevere with the TPN and a tiny bit of enteral (via the tummy) feeding. We did start the enteral feeding today - although you can hardly call it feeding - she is receiving 1ml an hour of her normal prescription milk but less concentrated, over a 20 hour period. ie: 20mls a day of milk or five teaspoons!!!!! We are going really slowly with the feeding, the doctors here know Daisy so well and they know that if we push her too quickly then she will suffer a setback. No one is completely convinced that she will ever be back to her regular regimen of 70mls/hour of concentrated feed. At the moment the best Andy and I are hoping for is a combination of TPN supplemented with some enteral feeds, this would be enough to get us home at some point. I'm staying late at the hospital tonight then going home as Andy has to leave early to get to the Reading office so will not be able to drop the children off. Xanthe came home from school with a sore throat and croupy cough so I am already anticipating that tomorrow will be a bit of a nightmare . She probably will not be able to go to school and she can't sit in Daisy's cubicle because of the infection risk, she can't go to anyone elses house if she is feeling poorly so I'm going to have to juggle big time tomorrow. I have a nurse sitting with Daisy from 3 till 7 tomorrow evening so at least that time is covered - roll on the weekend! Of course all of this happened when I had just nipped home to sort out the various musical/scouting activities that our children are involved in. As Daisy's vein access is via a portacath it could be reaccessed on the ward. Normally fairly straightforward but Daisy being Daisy it took 3 attempts! Fortunately she is currently on antibiotics and this so far has kept any infection at bay. Her antibiotics are currently being reviewed, she has a regular prophylactic dose of one sort to prevent the recurrent UTIs caused by her bowel disease, however the bugs are now resistant to this one so we are going to have to start her on something else, always a bit worrying as her bugs can become resistant to that and our options decrease. She is already colonised with MRSA so we have to keep the big hitter antibiotics in reserve for use incase she develops an active mrsa infection. I am full up with cold and Andy is brewing one too, so we are worried that Daisy will pick it up. The ward is full of children with bronchiolitis and while she is in isolation, she is so susceptible to infection particularly given the immunosuppressants and steroids she is currently on. In fact I have now nicknamed the bit of the ward we are currently resident on "bronchi alley" as all the cubicles here are full of little babies on oxygen - I'm just keeping the door shut and staying out of the parents' room! We had a busy day today - a trip back to GOS to see her Oncology consultant. Daisy has had a named oncologist since she was a baby when she was suspected to have neuroblastoma. Since that time a lot more is now known about the causes of Daisy's syndrome and the associated malignancy risks - between 15 - 17%. Her oncologist was not aware of this and agreed that these risks were bigger than he had previously known and now we know she also has such extensive inflammation in her GI tract this adds to her risks. He is going to manage her screening protocols at GOS now as she is very difficult to scan normally as she has megacolon and the bowel disease makes ultrasounds quite uncomfortable for her. She had a scan today, always a worry as we do know of other costello families who have had tumours diagnosed during these routine scans. She will have them every 3 months now and will have another review with the oncologist in February. 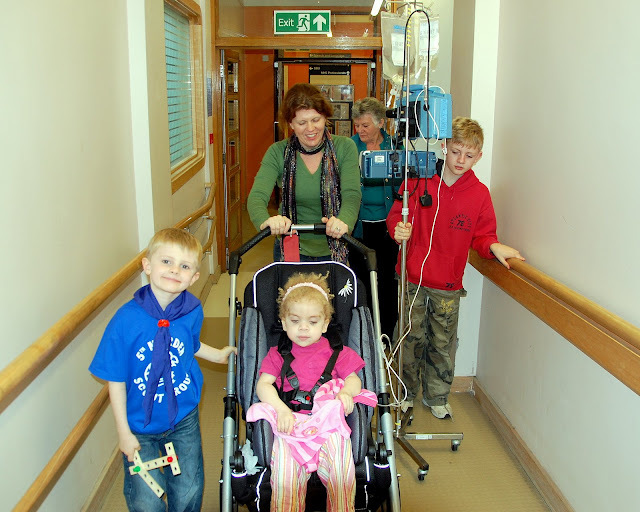 We had to wait forever for an ambulance to transport Daisy back to Queen Mary's, it was getting very hairy as her TPN was beginning to run low and we had to reduce the run rate. Fortunately the ambulance crew had previously transported Daisy and remembered her going hypoglycaemic on them before so they turned on the blue lights to get us back before the TPN ran out, although I did need to use some hypostop on her towards the end as she was showing signs of low blood sugars. We're due back at GOS for another outpatients appointment in 3 weeks so we'll take some emergency fluids in case we end up staying there longer than anticpated. Life was so much easier when all I had to remember was a dummy and some nappies, it becomes a fairly exclusive club when your main means of transport is ambulance and you carry around spare bags of saline with 10% dextrose and tubes of hypostop. Coming back to the local hospital was such a relief but at the same time reality has hit us a bit. 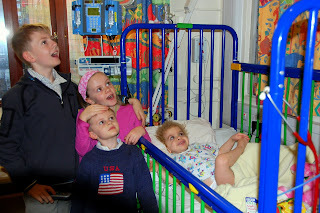 Last week we kept going with the adrenalin of dealing with all of Daisy's issues and the medical emergencies which always seem to happen when we are at Great Ormond Street (not to mention the battles with bureaucracy). Now we are back to a slower pace and trying to juggle school runs, afterschool activities and childcare with minimal sleep. Andy and I are taking turns to spend evenings in the hospital, leaving at about 10.30pm and I return at about 8am after dropping the children off at a friend's house and Andy at the station, what sleep we are getting is not great as we are torn between needing to be with the 3 older children and being with Daisy. The reality is though there was no way I could continue to spend every night with Daisy in hospital, the nurse handed over this morning that she had had a very restless night, awake and crying and needed top up pain relief overnight. At least the night nurses can go home and catch up on sleep, that's impossible for me as Princess Daisy does not sleep at all during the day - in fact both of us are in serious need of some undereye concealer. She is still on 24 hour TPN and IV steroids as well as iv antibiotics for a UTI. We hope to transfer her to steroids through the gastrostomy tomorrow but will not think about gastrostomy feeding until next week. I just have a feeling that we will be going home on TPN, even if it is night-time only with some gastrostomy feeds during the day. As we are going to be in for a while, stuck as always in isolation because of her immuosuppressed status and the lovely MRSA colonising her gastrostomy, we have been trying to put some better support in place for her. Daisy has lost a lot of muscle strength since being in hospital so the physiotherapists are going to see her at least a couple of times a week, they brought a floor mat up to her room and it was great to just sit on the floor with her and play row row the boat. The ward teacher has also been in touch with her school so that we can still work on all the things we had started at school. I'm really hoping that they will send someone in even just once a week so that we can continue with her signing - it was coming on so well and she really needs specialist input to help her communication skills. Daisy's receptive skills are great, she understands loads, she has problems communicating however, although I have found she is pretty good and making her feelings felt, most of the ward staff know the sign for "finished" and "no". 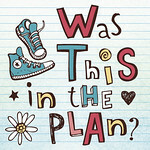 It feels like forever since I have blogged, mainly because the rollercoaster ride of life with Daisy was going a bit too fast to take time out and write it all down. I am now the proud owner of a shiny new laptop with wireless access however thanks to a lovely gift from my mum and Andy (combined Christmas & birthday!) so I can try and write things down as they happen. Daisy's gut problems are extreme, in some areas the inflammation and damage it has caused is aggressive. Unfortunately it is not caused by a virus as we had hoped as this would have meant it could be cured but is autoimmune in origin. Basically her body's immune response overreacts and causes it to attack itself. The treatment for this acute phase is massive doses of steroids and immunosuppressants, weaning down to maintenance doses to try and keep the immune system in check. She is now on 24 hour TPN and the hope is that at some point we can try and reintroduce enteral feeds through her gastrostomy but at this point we don't know if she will ever be off the TPN. 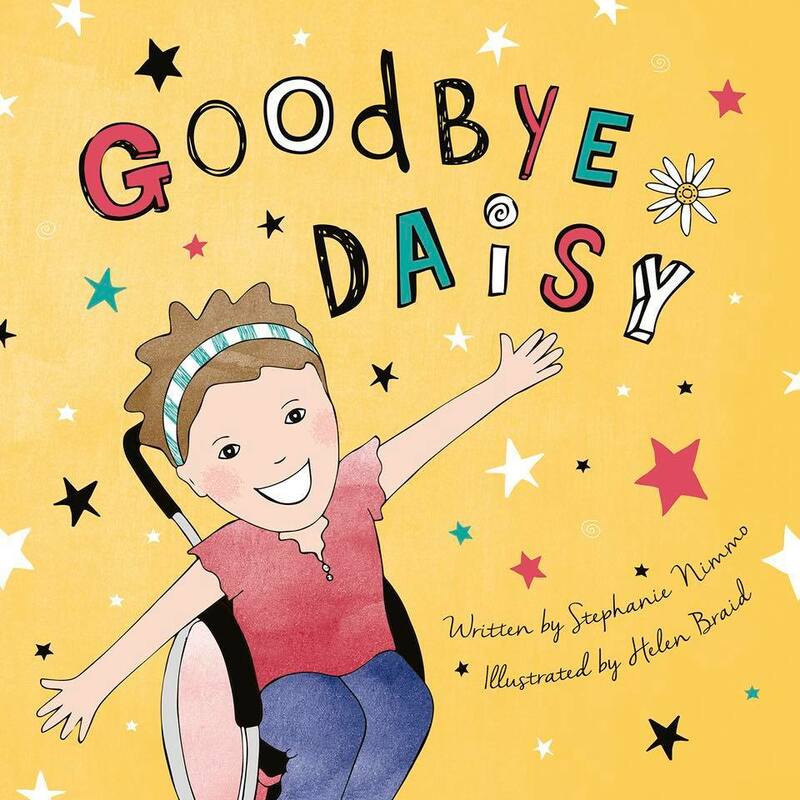 Her consultant was very suprised at how severe Daisy's inflammatory bowel disease is, particularly as it is rare to see it in a child so young. I bumped into the lovely Prof Hennekam, her geneticist, while on Rainforest ward, and he was very taken aback, there are no reported cases of children with Costello Syndrome developing this condition and as far as we know the only CS children who have required TPN were undergoing chemotherapy at the time. 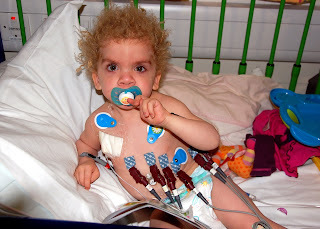 After a couple of days of TPN running through the port Daisy developed some strange heart rhythms, the cardiologist came to see her and arranged for her to have a 24 hour ecg done (she has these done regularly to check that her mild cardiomyopathy has not progressed). Five days after having her port placed someone had the bright idea to do a chest xray to check it was correctly placed. Well, turns out it was not correctly placed, the line was too far down and interfering with her heart function, needless to say she was back on the emergency list for a port revision asap! We felt very vindicated in standing our ground not to have Daisy transferrred prior to starting treatment, particularly given the risks of an incorrectly placed port! There was so much more going on during Daisy's stay on Rainforest and I don't want to give too many details in this blog - Andy and I are in the middle of a letter giving feedback to the Matron of the ward. Great Ormond Street is a fantastic hospital and we are so lucky that Daisy is able to be treated there, many of the people we met were wonderful and with Daisy's anaesthetic risks we would not entrust her to any other hospital. Sadly, however, some areas of her care were so poor, samples going missing, drugs being prescribed without informing us, poor communication between doctors to the point that I was being asked what the plan was for some of her meds, we frequently found that it would take at least half a dozen times of asking for things to be done, such as removing an old canula that no longer worked, meds being administered late....I could go on. I think the worst thing for us above anything else however was that bed management seems to be the key driver over and above the clinical care and needs of the child and family. On the main ward board children were listed by their hospital number (easy to tie up number to patient a their names were written on the door of the cubicle) and next to it an estimated date of departure, it this date was exceeded it was circled in red! We felt that inspite of Daisy's problems and the fact that we had actually been given some really bad news, news that essentially worsened Daisy's prognosis, we were just overstaying our welcome. Seems that with all the pressure on beds some basic humanity was missing. We know from our experience in GOS that this is not the case in all wards, unfortunately senior staff on this ward had clearly made this their priority. Anyway, enough of the rant, our lovely team back at Queen Mary's did everything possible to get her back and she was eventually transferred back on Sunday morning. It is such a relief to be back "home" everyone has been popping in to say hello to her. We are so much happier she is here, the doctors are in regular phone contact with GOS in terms of her management but we are so fortunate that the nursing team here are so experienced and capable and can manage her TPN needs, I heard from other families in GOS that the main reason they were far from home was that their local hospital could not manage TPN. The reality now is that Daisy will be here for a long, long time. We don't know if the treatment is working, GOS want to give it a good 6 weeks, and we have no idea if she will get off TPN completely. I'm hoping that we may eventually be in a situation where she has TPN overnight and maintenance fluids through her gastrostomy in the day to keep her blood sugars up. With so many other issues going on Daisy's endocrinologist has taken her off Growth Hormone Therapy for the time being, the main reason she was on it was to regulate her blood sugars which are liable to dip low if she is not being fed continuously. We spent a year persuading the exceptional circumstances panel at our primary care trust to fund the therapy, so I really hope she can resume it at some time (although I don't miss giving her the injections). As Daisy is clearly going to be in long term I can't stay with her every night, but at least we are only 10 minutes drive away. I think I will give her a couple more nights to settle in back here - the pain management team are also going to come out at some point to try and find a better solution to managing the discomfort she experiences at night time when her bowel goes into spasm, if we can get that under control I will be happy leaving her overnight, especially as the staff here know her so well and are very experienced in settling her. Theo told me yesterday that his only wish for Christmas was to get Daisy home, sadly this is not going to happen, however we were able to tell the children that our hospice, Chase, has arranged for us all to stay there at Christmas - they were over the moon, for them that is even better than Daisy coming home for Christmas. Daisy's birthday is 3 days before Christmas and again with the help of the nurses at Chase we hope to get her out for a few hours. We are so grateful for the support of two fantastic charities; Chase Hospice care for Children and The Rainbow Trust. Both support families with life limited children and get little or no government funding, yet without them Andy and I would not get time out from sitting with Daisy in hospital, I have had a couple of opportunities to take some time out when a carer from one of these charities have come to sit with Daisy, this gave me to do some normal stuff and regroup ready for the next challenge. My best day had to be meeting up with a couple of my friends for lunch in Wimbledon village followed by a free makeover at Space.NK - that was better than a full nights sleep, I caught up on gossip, ate something healthy that was not microwaved and had makeup applied that got rid of the dark circles under my eyes........priceless! Andy is doing the night shift at GOS tonight and I really should be doing domestic goddess things like putting the washing away but instead I have snuck into Theo's room while he is asleep with a big glass of wine to check my emails and update my blog on his computer. Joking aside, it's not been easy being back at GOS and persuading the team, most of whom were meeting Daisy for the first time, to make her more of a priority than they currently were. Her test results changed this. After a few delays on the Tuesday Daisy eventually went to theatre for her upper and lower endoscopy. She has had a lot of problems with anaesthetic previously and this had been our biggest concern while taking her to theatre, we just did not think about test results, so many have been inconclusive. Not this one. The consultant who had scoped her was waiting for us in the recovery room to show us the pictures he had taken of Daisy's gastrointestinal tract. Basically from top to bottom she has severe inflammation, ulceration and scarring - the pictures made us wince, her gut is raw...... He took lots of biopsies and blood and currently they are looking at whether this is caused by an increase in her existing gut inflammation, an autoimmune problem where the body attacks itself or the results of a viral infection. The problem is if it is the first two the treatment is to up her dosages of immunosuppressants and steroids, the side effects of which are cancer,something her pre-existing costello syndrome gives her a 17% increased risk of, if it is a virus they need to look at treating it. These results now meant that Daisy could be prioritised to have a permanent line placed into her veins as there was no way she was going to be able to continue to take nutrition in her stomach. So at 4pm today she went to theatre again to have a portacath placed. This is a permanent line into her jugular vein (or dracula vein as the surgeon so tastefully called it). All the Gastro consultants and registrars will discuss Daisy's case tomorrow and meet with us midday to discuss plans, we have asked that an oncologist be involved in these conversations given her increased cancer risk and the possible treatment options. We do know that now we have permanent vein access we can start Total Parenteral Nutrition (TPN) which is giving her nutrients through her veins and bypassing the stomach altogether. This will probably happen in the next 24 hours. Our big hope is that there will be a treatment plan and Daisy will be moved back to our lovely Queen Mary's Hospital for Children for her TPN and treatment. I did blog for a little while and life (and technology probs) took over, but I feel the need to get back to writing and with so much happening in my life it's going to be the only way for friends to keep up with what's going on chez Nimmo and especially with Daisy. So, those of you that don't have the latest update here it is in a nutshell - she started school (yippee!!!) and then went back into hospital (boo!!) but came out quickly (yippee again!!!) but went back in v quickly (OK enough of the pantomime!) and has been in hospital ever since. As always it's her gut, technically known as complex GI issues! Where do I begin... basically her whole gastro-intestinal system does not work properly - from her swallow to her bottom. Any infection sends it into shutdown and because it does not work properly this can cause infections (especially wee infections, in medi speak UTI's). It was a severe UTI that caused her whole gut to shut down as never before and spend a week pouring out bile from her gastrostomy, we attempted tiny amounts of feed after a week to challenge the gut but only got to 60mls an hour before she started vomiting again, this has been the pattern for the last month which she has spent in our local hospital - she is currently on about 28mls/hour of diluted feed supplemented by IV fluids. Getting the IVs into her has been fun and she is now on her 16th cannula as a result of very limited venous access. On Monday Daisy transfers from our lovely second home at Queen Marys where she is known and loved and cherished but where there is no intensive care and where she cannot be anaesthetised, moving to Great Ormond Street..... don't get me wrong, fabulous hospital, amazing intensive care but Daisy will be an interesting case there and we will have to start from the beginning as they like to do things there way and it always takes a few of her blips to convince the staff that really they should listen to me and her local doctors, we actually do know what we are talking about. It does not help that her main GI consultant is out of the country and will not be back to Great Ormond street (GOSH) until 10 November or that the registrars he has left in charge think Daisy is only going to be with them for 3 days then shipped back to the local hospital. Daisy never does less than a week at GOSH and always needs intensive care after a general anaesthetic so I think that they will be revisiting their GI bed availability come day 3.